This season marks a new chapter in the Sidney Crosby era of the Pittsburgh Penguins. The reign of Ray Shero and Dan Bylsma, which included a Stanley Cup, has ended. The locker room, rumored to have been plagued by a negative attitude, will have to find a new conscience. The star power is mostly intact but the coaching staff – as well as management – are all new. If it's hard for you to wrap your brain around all the changes facing the 2014-15 Penguins, imagine being Sidney Crosby. No matter what has transpired in the offseason, he is expected to be the leader of the team, both as captain and as the most skilled player on the ice. While a place in the HHOF surely awaits him, in this next chapter Crosby plays for his legacy. The sports world becomes irrational when Sidney Crosby is the topic of conversation. He lives under a spotlight of constant scrutiny. If the Pens falter, Crosby isn’t a good leader. If they flourish, well, then of course they did, because they have Crosby. In 20 years when hockey observers look back at his career, what will be said? What will be the legacy of Sidney Crosby? After the Cup win in 2009, Crosby reemerged that October as a complete offensive player, while upping his defensive game. By November, he was dominating the league. Including the playoffs, he put up 139 points that year. 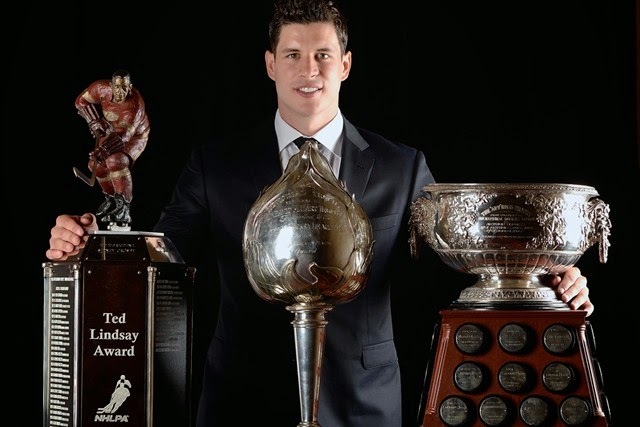 That June, Crosby was named the Ted Lindsay Award winner as the league's most outstanding player as voted by his NHLPA peers; a true vote of respect. This past season 2013-14, Crosby was healthy but his team wasn’t. The Penguins managed to win the Metro division and Crosby cleaned up at the NHL Awards winning the Hart, Ted Lindsay and Art Ross trophies. Wasn't all of that enough to forge a legacy? Are personal awards and miraculous come-backs enough to secure a legacy? Over the course of their careers, greats like Gretzky, Lemieux, Orr and Howe had multiple Stanley Cups, scoring titles and Hart trophies. When people speak of their legacies they speak of leadership, elevating the play of their team and personal skills. What will it take to include Crosby’s name with theirs? Crosby is already considered a leader in every sense of the word. Mike Babcock, who has coached Sid on two Olympic teams, said, "He's a great competitor. He's a committed, committed guy to getting better. He's a leader in that way and that's why he's been so successful." If you need evidence of the effect Crosby has on his teammates, just look at their results with him in the lineup compared to when he's not. Look at the career of Chris Kunitz; would he have been on the Olympic team without Crosby? There is no doubt that a place in the HHOF awaits Crosby but what could possibly keep his name from being mentioned in the same sentence with Gretzky, Lemieux, Orr and Howe? Crosby has already cemented a legacy as a great player. But in order for him to be counted among that group – the best players ever – he needs more playoff success, and at the very least, another Stanley Cup. In the past 3 playoff seasons, he has scored 11 goals and totaled 32 points. By contrast, in the 2008-09 playoffs alone he had 15 goals and tallied 31 points. All of this scrutiny may seem a bit unfair to Crosby because no matter how well he plays, he's judged based on the production of his teammates. The challenge for the Pens will be to surround their captain with a supporting cast that will provide him opportunities to scale new heights. It is often less about what he can do, but more about how much he can coax out of his team and his teammates. Crosby hasn’t been back to the final since winning the cup. Even though he has enough trophies to fill a room, they matter less than the big one. Finishing at the top of the conference and making it to the playoffs every season may be good enough for some teams, but the Penguins have made it clear that they expect to win the Cup. If anyone doubts that, please remember they fired the winningest coach in their history and traded a player who scored 61 points in a very public statement of dissatisfaction. I’m not saying Crosby’s job is in jeopardy but his legacy may suffer. His captaincy carries an extreme amount of pressure, but also offers tremendous opportunity. It will be compelling to see how he rises to it.